You’ve heard it before…fake it til you make it. Well, Fake Bake has you faking it and making your skin healthy. You shouldn’t have to sacrifice the health of your skin to get a rich bronze tan and you shouldn’t have to apply harsh chemicals to your skin to get a great tan either. Their line of self-tanning products contain only organic tanning agents with no artificial preservatives or parabens. Fake Bake’s sunless tanning formula with Dihydroxyacetone (DHA), DMI, and Erythulose delivers a safe and long-lasting golden tan that works with every skin tone and every skin type by enhancing your skin’s own pigments. Fake Bake sunless tanners also have a built-in color guide, a dark temporary color, when applied that “shows where it goes” on your skin so there’s no chance of having streaks. This means you get a perfectly even tan, every time. Fake Bake not only gives you the perfect bronze glow any time of the year, but also deeply moisturizes and protects your skin without clogging your pores or irritating sensitive skin. We have all taken selfies. Why not have a perfect glow when you do? Selfie® gives you a healthy, sun-kissed glow. Their products are easy-to-apply and won’t leave you with blotches, streaks or orangey tones. Designed for all skin types, Selfie® products develop gradually over time, providing a long-lasting, natural color that fades like a real suntan as your skin naturally produces new cells. Their Instant Body Bronzer is created with their bronzing beads that burst on contact that allows you to see where you have applied the color and control the depth of color. It’s lightweight, dries quickly and is fragrance free. The tan can be washed off when you desire. With AYU Sunless, there’s no need to sacrifice your health for your appearance. Their products nourish skin and deliver streak-free, smooth, rich tans that fade evenly. 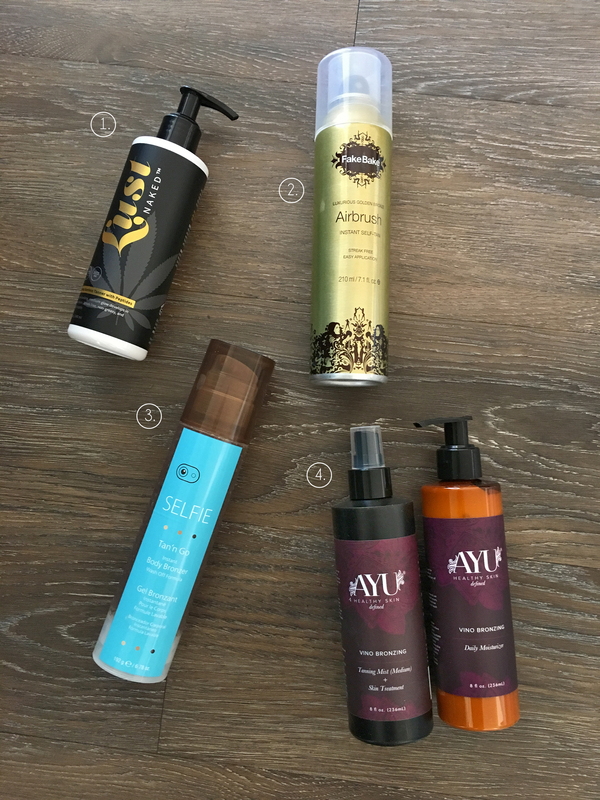 AYU products are made fresh in small batches and are rich in concentrations of natural, botanical ingredients. I love that AYU takes you from start to finish with their self tanners. Their Vino Bronzing Sugar and Seed Scrub exfoliates and moisturizes your skin, leaving your skin smooth and ready for tanning. Then, their Vino Bronzing Mist is a sunless tanning solution that delivers a brilliant tan with added skin treatment from Muscadine Grapes skin and seed extract and red wine powder. It helps nourishes the skin while providing beautiful tan. After you’re tan, use their Vino Bronzing Daily Moisturizer, which is rich in polyphenols, a potent antioxidant which fortifies the skin. This light weight lotion leaves your skin feel soft and hydrated and lightly fragranced. Your skin will be soft, healthy and tanned.